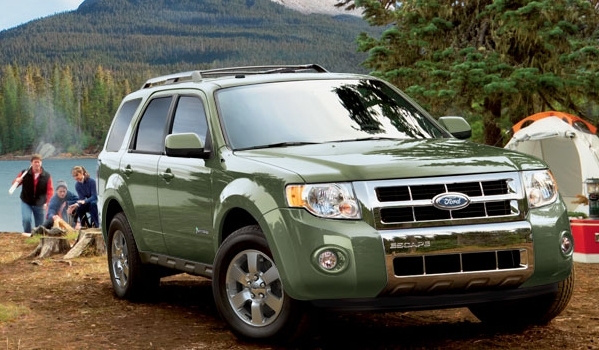 With an average fuel consumption of 32 miles per gallon, the Ford Escape Hybrid is the most fuel-efficient SUV on the American market. By that quality alone, it should be on every economy-minded car shoppers’ list. But the Escape Hybrid has more than stellar fuel economy to entice buyers – it also has savvy tech features, strong driving characteristics and a comfortable, well-designed interior space, thanks to Ford’s diligent upkeep of the second-generation model. The Hybrid is capable of driving 44 mph without the use of the gasoline engine, but it does so without compromising the quality of the drive – something of a wonder for a hybrid, and the inclusion of Microsoft’s SYNC voice-activation system takes hands-free controls to another level. The Escape Hybrid’s one downfall is a big one, though: the price hovers near $30,000 – which means it has a $4-5K premium over similarly-speced Escapes as well as the majority of the compact SUV competition. Still – even with Germany’s onslaught of clean diesel SUVs – you’d be hard-pressed to find another vehicle out there that can combine the fuel economy numbers, cargo space, functionality and comfort for the price. The most blatant reason to get the Escape Hybrid is for its fuel economy, but that doesn’t mean it lacks in other departments. A maximum 66.1 cubic feet of cargo space means this compact SUV will easily haul your gear with room to spare. Comfort level is high for the front seats, and most drivers will slide easily into the cabin space. Microsoft’s SYNC is still one of the best infotainment systems on the market. A starting price of $8,000 more than the base Escape is a tough sell, even with the extra amenities and boost in fuel economy. While the cabin is comfortable, it’s missing key extras like lumbar support, telescoping steering wheel and adjustable seat heaters. The Escape Hybrid sets itself apart from other hybrids simply due to the fact that you never feel as though the drive is compromised. It’s partly because it’s a compact SUV – thus, there is less demand on the quality of the drive than for sedans – and partly because of the balanced power delivery from the hybrid drivetrain. The Escape consistently gives you either power or efficiency when your driving demands it, and the switch between the two power sources is nearly seamless. Feathering the throttle takes patience – especially when you’re trying to cruise to 44 mph on electric power alone – but city mileage can reach much higher numbers than the EPA estimates if you do so. Regenerative brakes recharge the battery while stopping, giving you the option to cruise on electricity for quite some time, though brake pedal feel is a little dull as a result. When the engine does eventually kick in, the four-cylinder Atkinson cycle engine never feels underpowered despite its small displacement. It does sound a bit buzzy, but that’s typical in these types of engines. Steering is direct and the suspension absorbs bumps and rough roads well, and with lots of legroom and great visibility, the Escape Hybrid is more than comfortable on long journeys. A 2.5-liter four-cylinder Atkinson cycle engine and electric motor combine to deliver 177 horsepower for the Escape Hybrid. 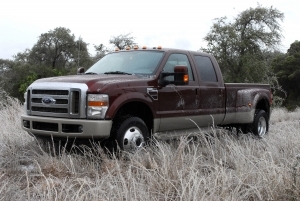 Power is recycled back to the battery through regenerative brakes, and you have a choice of either front-wheel or four-wheel drive. A CVT automatic transmission is standard. With just two trim levels, the base Escape Hybrid has a number of standard features that also carry over to the Limited trim. These include an audio input jack, SYNC, Sirius Satellite radio capability, dual-zone climate controls and cruise control. With the Limited, you also have access to a reverse sensing system, cargo cover, six-speaker audio system and leather seats. 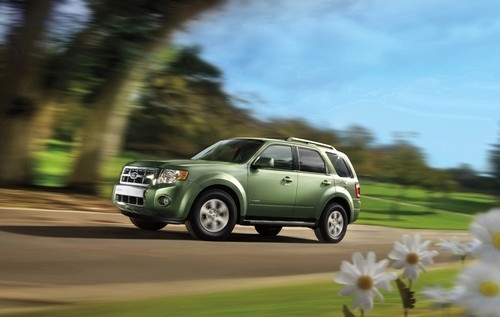 The Escape was one of the first Ford vehicles to receive Microsoft’s SYNC system, and the technology is still considered to be one of the best systems out there. It uses voice-activation commands to access menus and link phones through Bluetooth. The navigation system with weather information, real-time traffic, gas prices and movie times is a highly recommended option. The package also adds the Hybrid Energy Flow Display, which allows you to track fuel economy numbers and power distribution. Without a doubt, the Escape Hybrid is the most fuel-efficient SUV on the market (tied with its brother, the Mercury Mariner Hybrid). It receives 34 mpg city and 31 mpg highway in FWD and 30 city, 27 highway in AWD, but can easily see higher numbers if you utilize that 0-44 mph electric mode. Especially in the city, the Hybrid boasts a significant difference in fuel economy with the standard Escape, which gets 21 mpg city, 28 mpg highway in FWD. 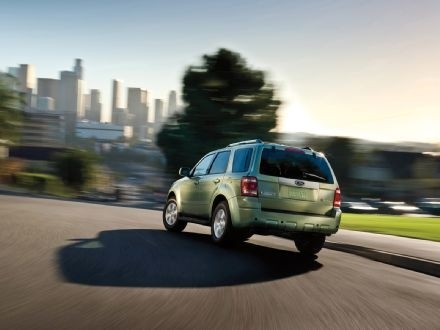 The Escape’s interior is spacious and roomy, with plenty of legroom and headroom for all passengers. The hybrid battery manages to avoid interfering with the amount of cargo space, which is expanded thanks to the 60/40 split folding rear seats. 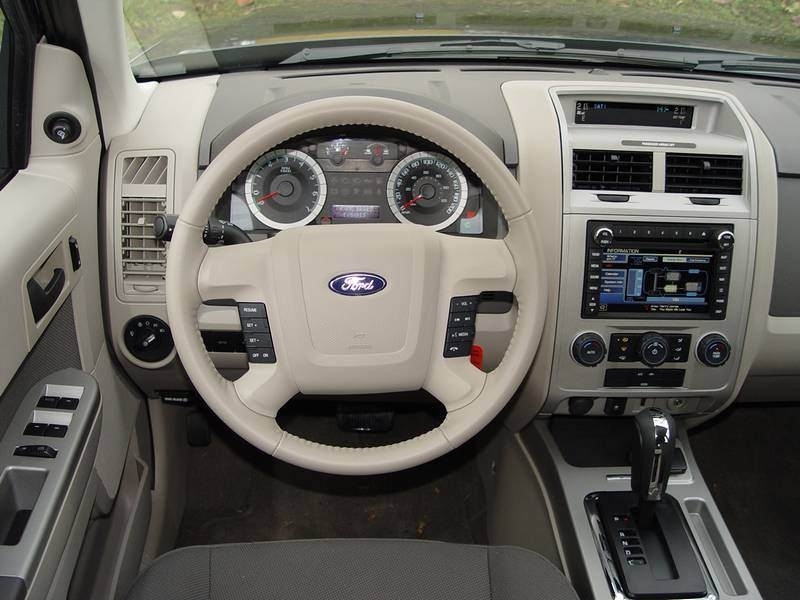 The instrument panel is clean and the touch screen blends in nicely with the more utilitarian interior styling. While many compact SUVs are looking more and more rounded and softened, the Escape retains a typically boxy SUV shape. There aren’t any fussy lines, just a bold front grille, squared-off taillights and protruding wheel arches. Aside from its own sibling, the $30,105 Mariner Hybrid, the Ford Escape Hybrid doesn’t really have much direct competition. 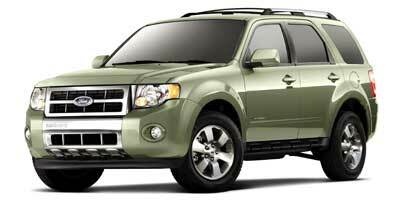 It starts at $29,860 – over $8,000 more than the base Escape – and rises to $32,370 for the Limited trim. Fuel economy can’t be matched by any other company, but you’ll want to cross shop the $25,995 Subaru Forester 2.5X Limited and $23,090 Mazda CX-7, as well as take a look at the $24,615 Jetta TDI Sportwagen. Another option is to hold out until Toyota’s RAV4 Hybrid makes an appearance in a couple of years. It may be pricey considering the non-hybrid competition, but the Escape Hybrid has a combination of qualities that other vehicles can’t quite match. It has all the right features – comfort, tech, spaciousness and fuel efficiency – to make it one of the best hybrid buys on the market.